Ants represent an interesting example of social insects and thus the chemical composition of their epicuticle is widely explored including in order to learn about the way they communicate. Much of the chemical ecology research of ants is focused on their wax hydrocarbons structure. In a previous post we described the results of our study of Ants Communication Exploration via their Wax Analysis by GC-MS with Cold EI – The Unique Role of Hydrocarbon Isomer Distributions. As often the case, when new and powerful equipment is being used new discovery are being found as described in this post. 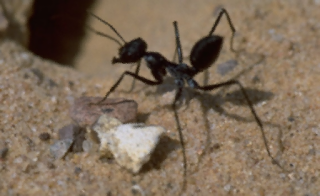 We followed our exploration of the chemical structure of Cataglyphis ant waxes with the Aviv Analytical 5975-SMB GC-MS with Cold EI via sampling with the CPAV7980 ChromatoProbe sample introduction device. The ChromatoProbe allowed us to introduced ants body parts and glands without any sample preparation for their intra injector thermal extraction combined with GC-MS with Cold EI analysis with its features of having significantly enhanced molecular ion abundances, amplified isomer structural mass spectral effects and the ability to have tail free GC-MS analysis of underivatized free fatty acids. Keep reading how the 5975-SMB GC-MS with Cold EI in combination with the CPAV7890 ChromatoProbe brings new, untapped and important chemical information about ants wax composition. Injector: 250ºC injector temperature with Pulsed Split injection at 30 PSIG. Sample: The following Ctaglyphis ant body parts and glands: Head, Chest, Dufour, Gaster, Thorax and GPD. These body parts were placed as is inside the 3 mm OD, 2.4 mm ID ChromatoProbe vials and introduced with the ChromatoProbe into the hot injector for 30 seconds thermal extraction and than removed while plugging the ChromatoProbe. GC Oven: 60ºC for 30 s followed by 20ºC/min to 320C and wait 4.5 min for total of 18 min. He column flow rate: 2 ml/min with flow program after 11 minutes to 12 ml/min at 5 ml/min.min followed by backflush after 15 min. Injection volume: whole one head. SMB transferline temperature: 250ºC with temperature program of 10ºC/min after 7 min to 320ºC. The ChromatoProbe device is aimed at bringing solids, sludge and other dirty samples into the GC injector in a small vial for their intra injector thermal desorption (extraction). Its first name was direct sample introduction device (DSI) and later named ChromatoProbe. 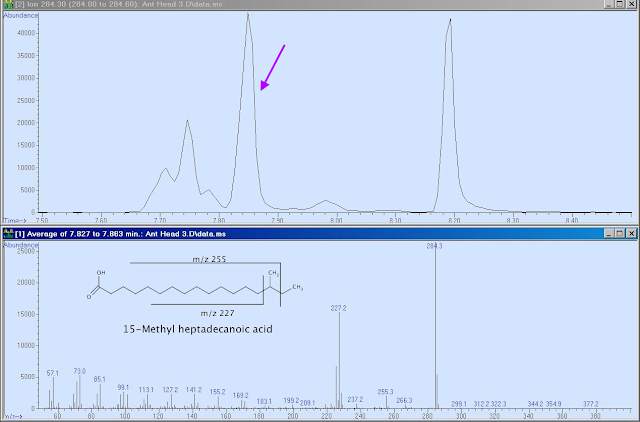 It is sold by Aviv Analytical as its models CPAV7890 and CPAV6890 ChromatoProbe. 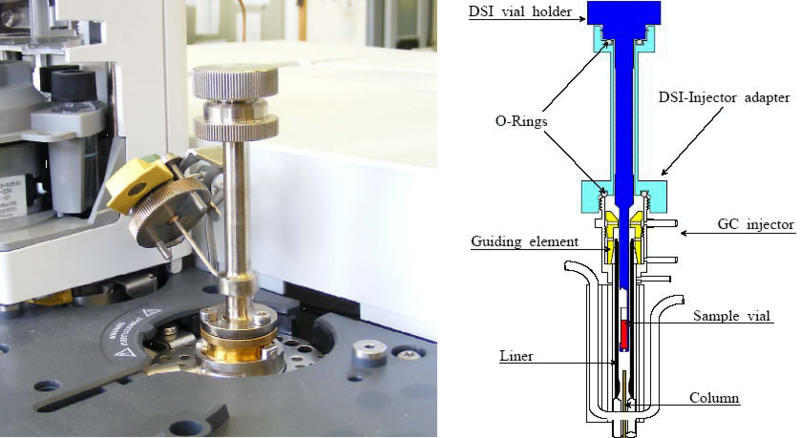 A photo of the Aviv Analytical CPAV7890 is shown above (left photo) together with its schematic diagram (right). More information on the ChromatoProbe, its method of operation and over 100 literature references can be found in Professor Amirav's ChromatoProbe website. The ChromatoProbe enables thermal extraction which include all the ant head sufficiently volatile compounds (at the injector temperature) regardless their polarity, while solvent extraction could be biased according to the sample solubility which can be poor for example for acids in hexane. In addition, the dirt and leftover ant head remains in the vial and is discarded after the analysis without leaving any deposit on the liner and or column, which is important for free acids analysis. 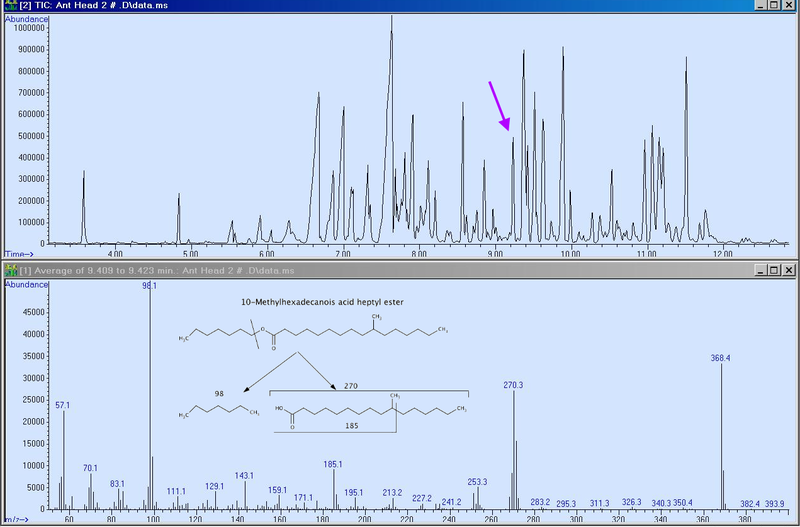 It is important to mention that the ChromatoProbe sampling of polar compounds is followed by the use of the 5975-SMB GC-MS with Cold EI with its fly-through ion source which can serve for the analysis of underivatized free fatty acids without the standard ion source compound dependent tailing and decomposition. Only column related tailing is possible if the column is not in good condition as well as earlier onset of peak fronting due to lower column sample capacity for polar compounds. Thus, we used an ultra inert column for the elimination of column related tailing. We found a large number of fatty acid esters in the ant heads. These esters span the molecular weight range of 312.3 up to 438.3 and all of them shared the low mass fragment m/z=98.1, characteristics for heptyl esters. The acyl moiety constitutes a range of linear and branched fatty acids, corresponding to the free fatty acids found also in the head (see below). These esters were as abundant as the ant wax hydrocarbons and found in all three heads that were studies while they were absent in all the other body and gland parts. Possibly this is a new and interesting finding and its significance should be further explored. We found that the ant parts included acids, both with linear chain and branched acids. The heads included larger relative amount of free acids with greater abundance and variety of branched free fatty acids isomers. We found several steroid based free acids in the form of few isomers with m/z=302.3 and one with m/z=300.3. These steroid acids were found in head #3 but not in head samples number 2 and 1. These acids were also found in the Gaster and Thorax samples. The finding of these steroid based free acids is new as they can not be analyzed by GC-MS with standard EI without derivatization. All the ant parts and glands exhibited wax hydrocarbons in both linear chain and branched isomers forms. 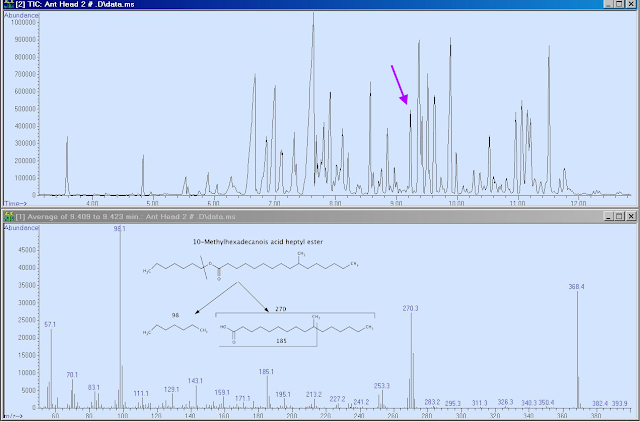 The 5975-SMB GC-MS with Cold EI opens the door for a unique and highly effective isomer distribution analysis characterization of the ant wax hydrocarbons, acids and esters. The unique finding of esters was also accompanied by the finding that each ester had a few isomers. Thus, we feel that isomer distribution analysis can serve as a novel tool for ant chemical ecology studies. We analyzed several Cataglyphis ant body parts and glands and in this post we focused on the ant head compounds analysis results since they are the most novel. We found that the ant head uniquely includes a large number of organic esters and that each ester included several isomers. We also found that the ant heads included a relatively large proportion of free acid and that most of these free acids were branched isomers as well as linear chain. We also found for the first time several steroid based free acids, again, in the form of few isomers. We conclude that it seems that the ant chemistry is based on having a plurality of isomers which probably serve in their metabolism and possibly plays a major role in their communication. Figure 1. 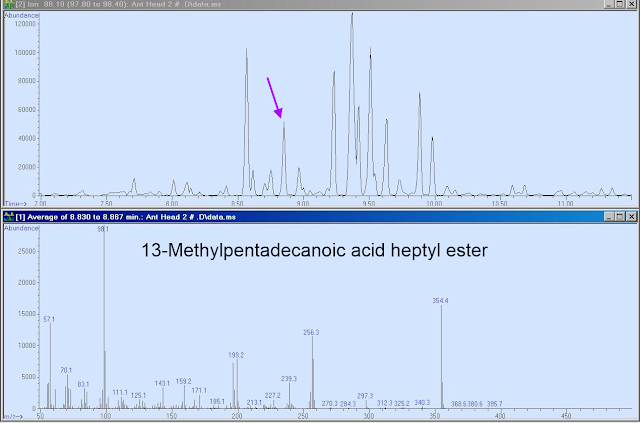 Mass chromatogram (TIC upper trace) of Cataglyphis ant head at the acids elution time window and a representative Cold EI mass spectrum of a branched isomer of palmitic acid C16H32O2 (bottom mass spectrum). Note the dominant molecular ions and rich and informative mass spectral information about the branching position. Figure 2. 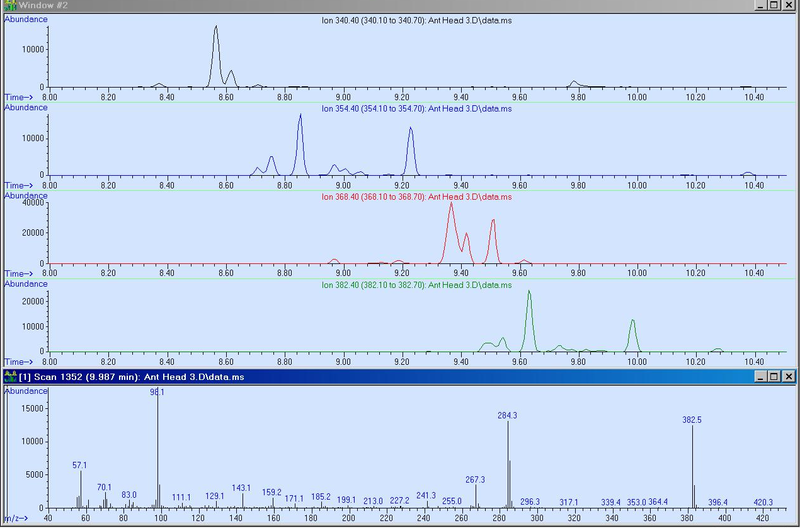 Reconstructed mass chromatogram at m/z=298 (RSIM upper trace) of Cataglyphis ant head at the stearic acid elution time window and a representative Cold EI mass spectrum of a branched isomer of stearic acid C18H36O2 (bottom mass spectrum). Note the multitude of stearic acid isomers. 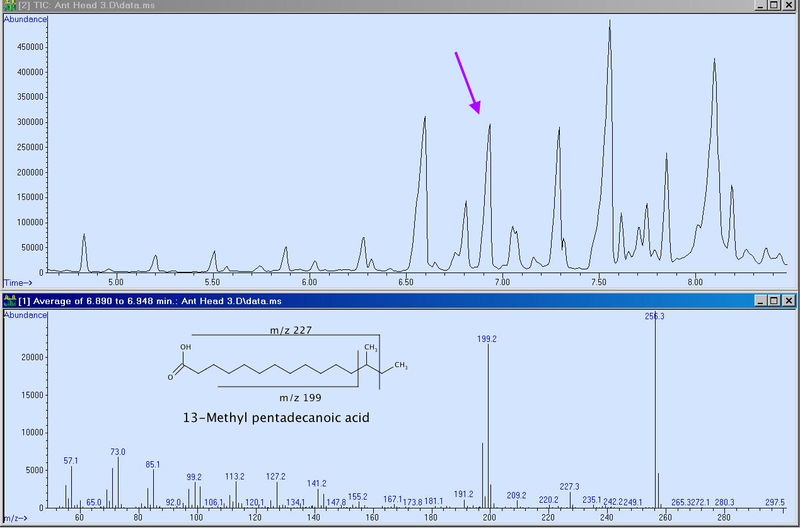 The peak at 8.2 min is of the linear chain stearic acid while the other peaks are of its branched isomers. Note also the dominant molecular ion and rich and informative mass spectral information about the branching position. Figure 3. 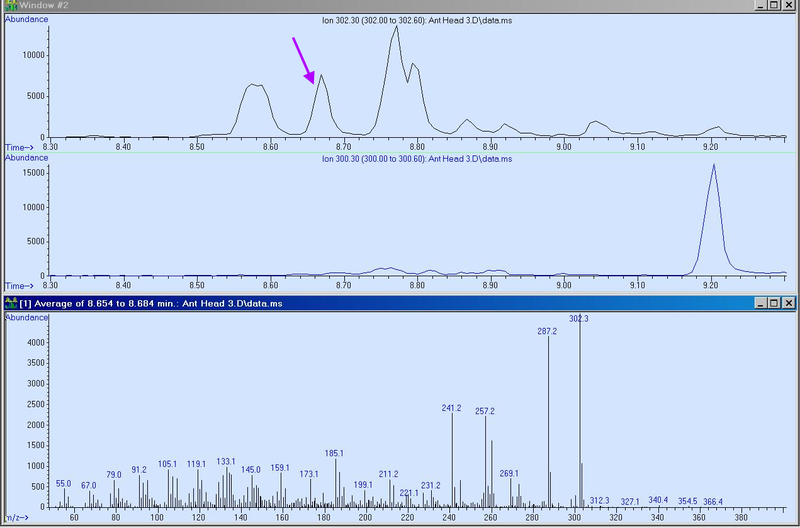 A comparison of total ion mass chromatogram of Cataglyphis ant head #3 (upper trace) and chest (bottom trace). The chest compounds are mostly hydrocarbons eluting after 10 minutes (the peak at 8.6 min is of dioctylphthalate impurity). The elution time window of 6-8.4 min is of various free acids, mostly with linear chain but also some branched free acids. 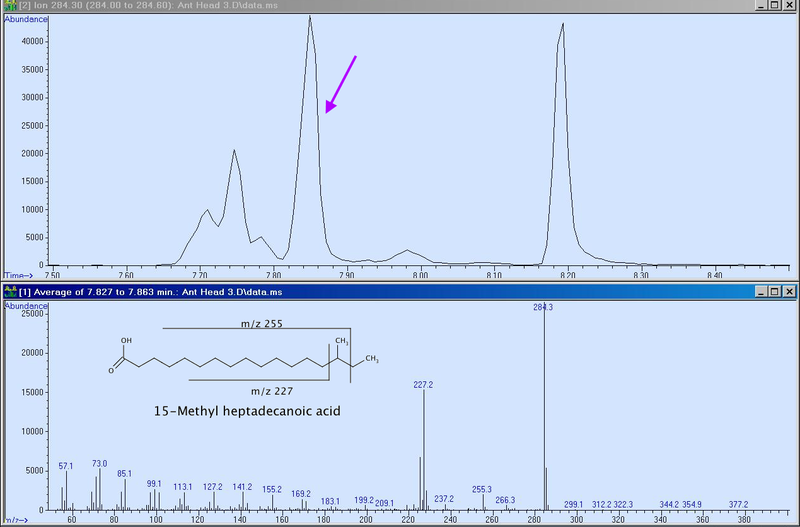 The chromatographic zone between these two windows is populated by various fatty acid esters in the head sample. 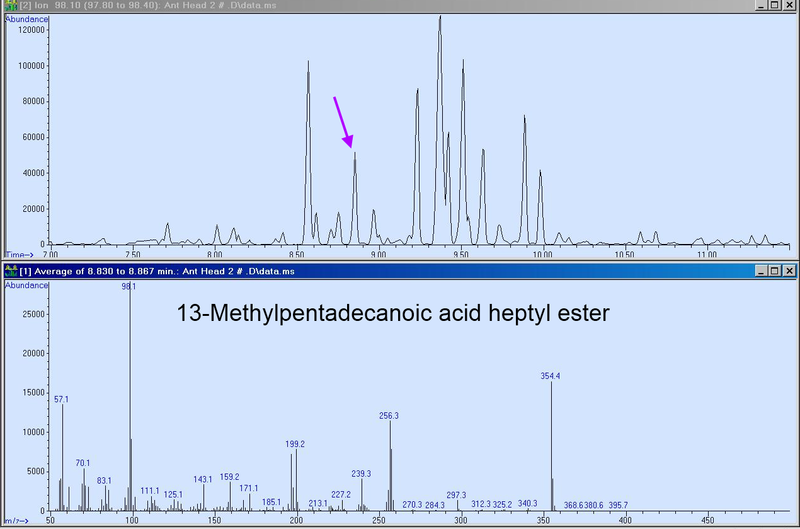 Note that the hydrocarbons are more abundant than the free acids in the chest sample but not in the head sample. Figure 4. Total ion mass chromatogram of Cataglyphis ant head #2 (upper trace) and the Cold EI mass spectrum of a typical ester with molecular ion m/z=368.4 (bottom trace) that eluted at 9.42 min. Note the informative Cold EI mass spectrum. Figure 5. 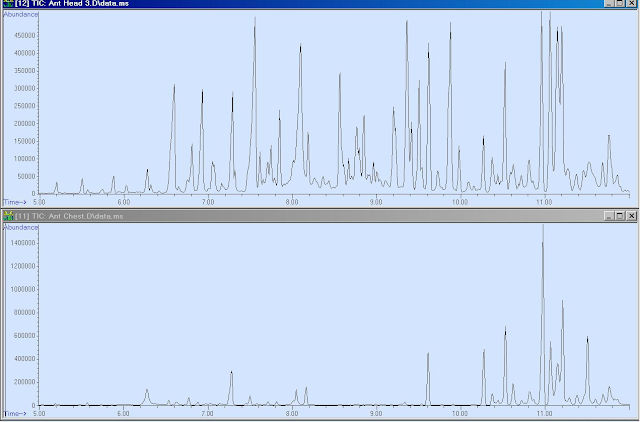 Reconstructed mass chromatogram at m/z=98.1 (RSIM upper trace) of Cataglyphis ant head #2 and a representative Cold EI mass spectrum of one of the esters that eluted at 8.85 min (bottom mass spectrum). Note the large number of esters with the fragment m/z=98.1 that span the molecular weight range 312.3 up to 438.3 of these esters. Figure 6. 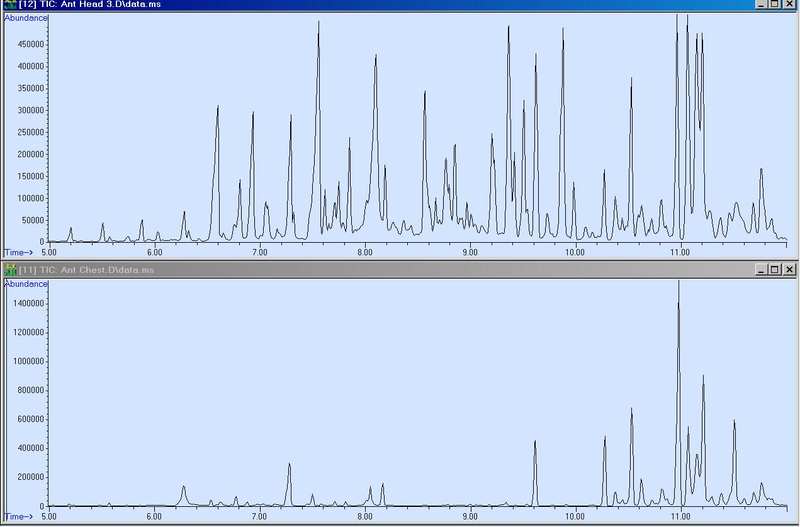 Reconstructed mass chromatograms at m/z=340.4, 354.4, 368.4 and 382.4 (RSIM upper four traces) of Cataglyphis ant head #3 and a representative Cold EI mass spectrum of one of the esters that eluted at 9.98 min (bottom mass spectrum). Note the finding of several isomers to each of the ant head fatty acid esters. Figure 7. 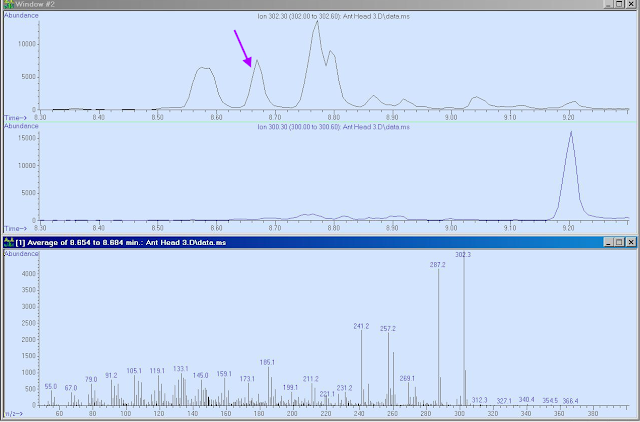 Reconstructed mass chromatograms at m/z=302.3 (RSIM upper trace) and m/z=300.3 (RSIM middle trace) of Cataglyphis ant head #3 and a representative Cold EI mass spectrum of one of the steroid free acids that eluted at 8.67 min (bottom mass spectrum). 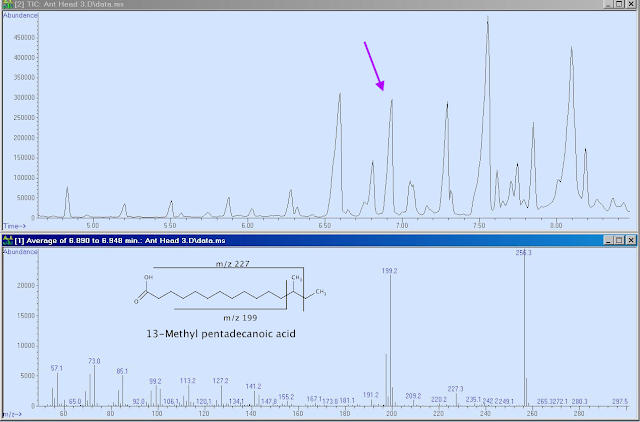 Note the finding of several steroid based free acids with possible library based identification as Pimaric acid, Palustric acid, Abietic acid and Callitrisic acid. Wow, very interesting. What do you think they are used for?? This is a very interesting finding. It surely adds to our knowledge especially methods of sampling from ants. it would be nice if this method is non-destructive (just my thoughts though).